I have a bit of time off work, so thought I'd try and get some painting done as I've been very slack with it in recent weeks. 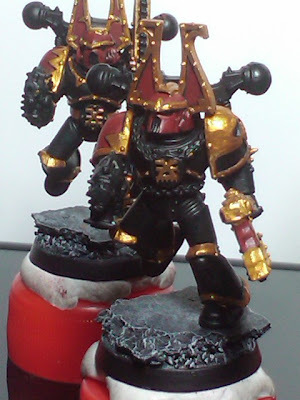 The red of the Berserker's was already done, I had originally gone off the idea of using gold metallic in favour of Yellow, however upon starting with the yellow I realised I liked it even less than gold. I went back to the old faithful gold, used two feet and jumped. 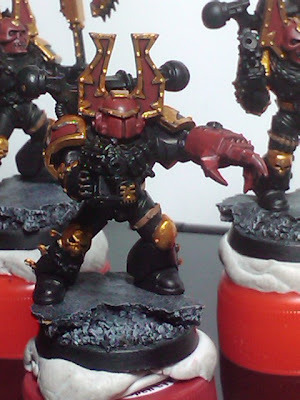 Before I put my gold down though I decided it would be worth while to use GW's Khemri brown as a base to make the gold fill better, rather than go straight onto black, it worked ok I guess. 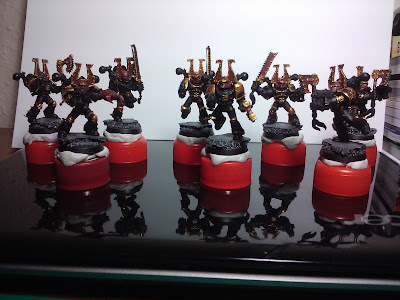 That's what I have so far, need to do the weapons, line highlights, details like chains, leather and eyes and whatever else. Hopefully I should have most of it done tomorrow. Coming on nicely mate, can't wait to give them the taste of the exploding lunchbox! clean look with good colours. I look forward to seeing them complete. Cheers guys for the support, been trying to get more done, but have had other things on the go. I've found listening to Sci-Fi Audio books helps my concentration greatly, so hopefully I won't be distracted so much from now on. My name is Kirsten Williams and I work with content for calculatem.com http://www.calculatem.com/ . We are now conducting a campaign towards blogs and for that reason, I am trying to get in touch with the person in charge of content and ads primarily on blogs. Is that you, or is there someone else I should speak to? Thanks for your time. A lone warrior on a long path through the warm embrace of the warp. Watch my journey as it unfolds, and be thankful too the Gods.